The autism group tonight was interesting. I liked the topic of sensory stimuli. I used to have problems with sensory overload, and wrote about them on this blog. I talked about my (what I think were) out-of-body experiences. Rhiannon finds sensory overload a serious problem, and often refuses to go out because of it. Labour are all over the place unfortunately. They remind me of the Tories in the UK between 1997 and 2003 - they went through leaders at about the same rate as Labour have in NZ, were deeply divided within the party, and seemed to lack any sense of direction. I wonder who my parents voted for (I never ask them directly). Well, with Mum I don't have to wonder at all. Dad has always been much more of a floater and has voted Green and Labour before (and Lib Dem in the UK) but, you know, he now lives in a household with 2000 vehicles per 1000 inhabitants, owns four properties, and goes on cruises for heaven's sake. Why wouldn't he vote National? There was a lot of discussion of the results at work today. People were looking at the interactive Herald page that shows the results from each polling place. Someone was trying to figure out a way of fiddling the Ohariu boundaries to gerrymander Peter Dunne (who got 0.22% of the party vote) out of parliament. 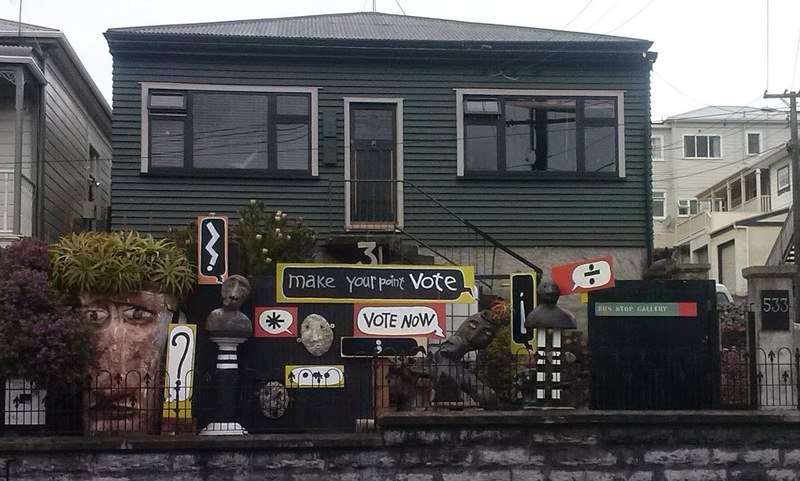 I took this picture in Berhampore in the weekend before the election. Pretty neat I thought. The division symbol is quite appropriate. I was thinking that as I'm reasonably good at counting (as Rhiannon says, I've got a degree in it) I should probably get myself involved in the vote counting of future elections. I should look into it. I wouldn't mind even doing a council election - it would be interesting to see the complex STV system with all its quotas and preferences unfold. That's all the election talk you're going to get from me. It's been a very choppy day (weather-wise) today. Update (Tuesday morning): I was woken by a reasonable shake last night. It was a 5.5, a lot bigger than the one on Friday night.